20 VDMA 2016 • VDMA MINING SUPPLEMENT For Huize, a 1,500-m-deep lead and zinc mine in the Yunnan prov- ince, Tianjin SIEMAG TECBERG Machinery Co. Ltd. will provide one of the deepest ore mines in China with a 5-m, six-rope floor-mounted hoist. "In the Chinese mining industry, revamping and upgrades are getting more into the focus of customers as they intend to enlarge their pro- duction capacities and increase the overall safety standards," Scheppe said. These local projects can be served with the establishment of SIE- MAG TECBERG in Wuqing. When extending the life of underground mines and adopting more stringent safety protocols, higher ventilation and cooling capacities will be required. With the patented Pressure Exchange System (PES) for underground air conditioning with centralized water cooling systems, SIEMAG TECBERG said it provides the technology for the most effi- cient systems. "SIEMAG TECBERG has taken appropriate actions of realization and verification of the performance and safety for hoisting plants. This includes the review of automation and hydraulic designs by qualified independent expert organizations to meet SIL 2 or SIL 3, depending on the risk analysis for the function in question. A typical system would include safety circuits, sensors, dual-channel hoist monitor (s-EHMU), motor isolation, closed-loop brake control, hydraulics and calipers, all certified individually and in combination. SIEMAG TECBERG delivers solutions by meeting customer's expec- tations of the OEM to take hoisting system responsibility. This is based on products that have proven to meet the high standards set by unique experience gained in the group worldwide and successfully extending the expertise of an automation and drive system integrator providing total solutions. The Kure copper mine in Turkey is the latest reference where SIEMAG TECBERG has provided such a solution including the electrical, automation, safety and shaft signaling systems. 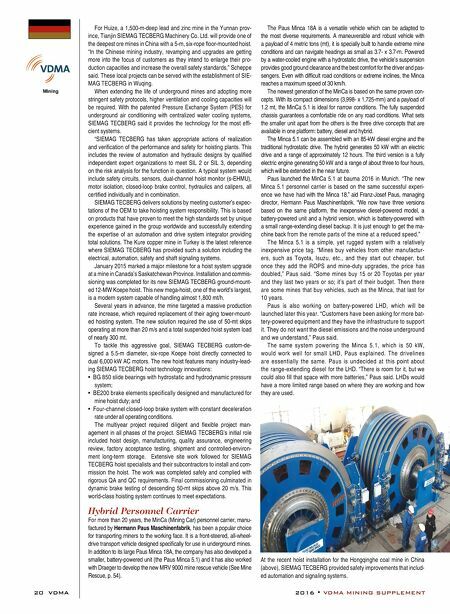 January 2015 marked a major milestone for a hoist system upgrade at a mine in Canada's Saskatchewan Province. Installation and commis- sioning was completed for its new SIEMAG TECBERG ground-mount- ed 12-MW Koepe hoist. This new mega-hoist, one of the world's largest, is a modern system capable of handling almost 1,800 mt/h. Several years in advance, the mine targeted a massive production rate increase, which required replacement of their aging tower-mount- ed hoisting system. The new solution required the use of 50-mt skips operating at more than 20 m/s and a total suspended hoist system load of nearly 300 mt. To tackle this aggressive goal, SIEMAG TECBERG custom-de- signed a 5.5-m diameter, six-rope Koepe hoist directly connected to dual 6,000 kW AC motors. The new hoist features many industry-lead- ing SIEMAG TECBERG hoist technology innovations: • BG 850 slide bearings with hydrostatic and hydrodynamic pressure system; • BE200 brake elements specifically designed and manufactured for mine hoist duty; and • Four-channel closed-loop brake system with constant deceleration rate under all operating conditions. The multiyear project required diligent and flexible project man- agement in all phases of the project. SIEMAG TECBERG's initial role included hoist design, manufacturing, quality assurance, engineering review, factory acceptance testing, shipment and controlled-environ- ment long-term storage. Extensive site work followed for SIEMAG TECBERG hoist specialists and their subcontractors to install and com- mission the hoist. The work was completed safely and complied with rigorous QA and QC requirements. Final commissioning culminated in dynamic brake testing of descending 50-mt skips above 20 m/s. This world-class hoisting system continues to meet expectations. Hybrid Personnel Carrier For more than 20 years, the MinCa (Mining Car) personnel carrier, manu- factured by Hermann Paus Maschinenfabrik, has been a popular choice for transporting miners to the working face. It is a front-steered, all-wheel- drive transport vehicle designed specifically for use in underground mines. 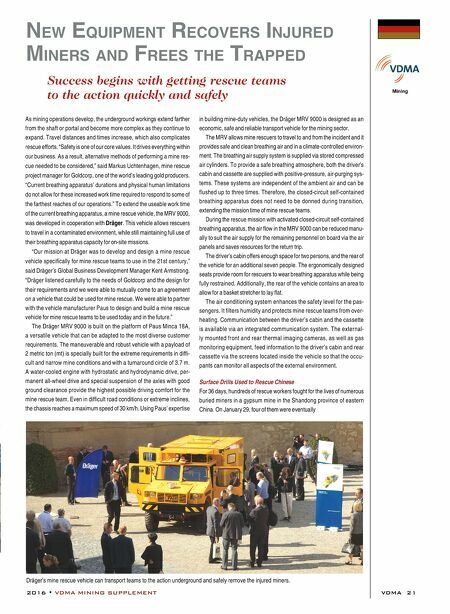 In addition to its large Paus Minca 18A, the company has also developed a smaller, battery-powered unit (the Paus Minca 5.1) and it has also worked with Draeger to develop the new MRV 9000 mine rescue vehicle (See Mine Rescue, p. 54). The Paus Minca 18A is a versatile vehicle which can be adapted to the most diverse requirements. A maneuverable and robust vehicle with a payload of 4 metric tons (mt), it is specially built to handle extreme mine conditions and can navigate headings as small as 3.7- x 3.7-m. Powered by a water-cooled engine with a hydrostatic drive, the vehicle's suspension provides good ground clearance and the best comfort for the driver and pas- sengers. Even with difficult road conditions or extreme inclines, the Minca reaches a maximum speed of 30 km/h. The newest generation of the MinCa is based on the same proven con- cepts. With its compact dimensions (3,998- x 1,725-mm) and a payload of 1.2 mt, the MinCa 5.1 is ideal for narrow conditions. The fully suspended chassis guarantees a comfortable ride on any road conditions. What sets the smaller unit apart from the others is the three drive concepts that are available in one platform: battery, diesel and hybrid. The Minca 5.1 can be assembled with an 85-kW diesel engine and the traditional hydrostatic drive. The hybrid generates 50 kW with an electric drive and a range of approximately 12 hours. The third version is a fully electric engine generating 50 kW and a range of about three to four hours, which will be extended in the near future. Paus launched the MinCa 5.1 at bauma 2016 in Munich. "The new Minca 5.1 personnel carrier is based on the same successful experi- ence we have had with the Minca 18," aid Franz-Josef Paus, managing director, Hermann Paus Maschinenfabrik. "We now have three versions based on the same platform, the inexpensive diesel-powered model, a battery-powered unit and a hybrid version, which is battery-powered with a small range-extending diesel backup. It is just enough to get the ma- chine back from the remote parts of the mine at a reduced speed." The Minca 5.1 is a simple, yet rugged system with a relatively inexpensive price tag. "Mines buy vehicles from other manufactur- ers, such as Toyota, Isuzu, etc., and they start out cheaper, but once they add the ROPS and mine-duty upgrades, the price has doubled," Paus said. "Some mines buy 15 or 20 Toyotas per year and they last two years or so; it's part of their budget. Then there are some mines that buy vehicles, such as the Minca, that last for 10 years. Paus is also working on battery-powered LHD, which will be launched later this year. "Customers have been asking for more bat- tery-powered equipment and they have the infrastructure to support it. They do not want the diesel emissions and the noise underground and we understand," Paus said. The same system powering the Minca 5.1, which is 50 kW, would work well for small LHD, Paus explained. The drivelines are essentially the same. Paus is undecided at this point about the range-extending diesel for the LHD. "There is room for it, but we could also fill that space with more batteries," Paus said. LHDs would have a more limited range based on where they are working and how they are used. At the recent hoist installation for the Hongqinghe coal mine in China (above), SIEMAG TECBERG provided safety improvements that includ- ed automation and signaling systems.